For thousands of years, Judean date palm trees were one of the most recognizable and welcome sights for people living in the Middle East – widely cultivated throughout the region for their sweet fruit and for the cool shade they offered from the blazing desert sun. From its founding some 3,000 years ago, to the dawn of the Common Era, the trees became a staple crop in the Kingdom of Judea, even garnering several shout-outs in the Old Testament. Judean palm trees would come to serve as one of the kingdom’s chief symbols of good fortune; King David named his daughter, Tamar, after the plant’s name in Hebrew. By the time the Roman Empire sought to usurp control of the kingdom in 70 AD, broad forests of these trees flourished as a staple crop to the Judean economy – a fact that made them a prime resource for the invading army to destroy. Sadly, around the year 500 AD, the once plentiful palm had been completely wiped out, driven to extinction for the sake of conquest. In the centuries that followed, firsthand knowledge of the tree slipped from memory to legend. Up until recently, that is. During excavations at the site of Herod the Great’s palace in Israel in the early 1960s, archeologists unearthed a small stockpile of seeds stowed in a clay jar dating back 2,000 years. For the next four decades, the ancient seeds were kept in a drawer at Tel Aviv’s Bar-Ilan University. But then, in 2005, botanical researcher Elaine Solowey decided to plant one and see what, if anything, would sprout. “I assumed the food in the seed would be no good after all that time. How could it be?” said Solowey. She was soon proven wrong. Amazingly, the multi-millennial seed did indeed sprout – producing a sapling no one had seen in centuries, becoming the oldest known tree seed to germinate. Today, the living archeological treasure continues to grow and thrive; In 2011, it even produced its first flower – a heartening sign that the ancient survivor was eager to reproduce. It has been proposed that the tree be cross-bred with closely related palm types, but it would likely take years for it to begin producing any of its famed fruits. Meanwhile, Solowey is working to revive other age-old trees from their long dormancy. Source: Stephen Messenger, TreeHugger, October 5, 2013. 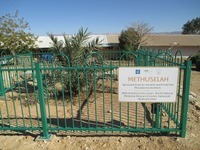 For a while, the male Judean date palm (above) was the sole representative of his kind: Methuselah’s variety was reportedly wiped out around 500 AD. But Elaine Solowey, director of the Arava Institute for Environmental Studies at Kibbutz Ketura in Israel, has continued to grow date palms from ancient seeds discovered in the region and said she is “trying to figure out how to plant an ancient date grove.” Doing so would allow researchers to better understand exactly what earlier peoples of the region were eating and how it tasted. At 2,000-years-old, one would think Methuselah is the oldest plant on earth grown from ancient seed, but this isn’t the case. Back in 2012, a team of Russian scientists unearthed a cache of Silene stenophylla seeds, a flowering plant native to Siberia, from a prehistoric squirrel burrow that had been covered by ice. 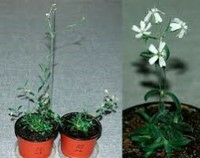 They eventually succeeded in germinating the 32,000-year-old specimens, which grew into an arctic plant (above) closely resembling the modern narrow-leafed campion. Sources: Ancient Origins; Laura Clark, Smithsonian.com, March 26, 2015; and Rachel Kaufman, National Geographic News.